Noticed that my backsplash caulking was separating. Hoping someone can help answer the below? The island is granite not sure what type of tile the backsplash is. 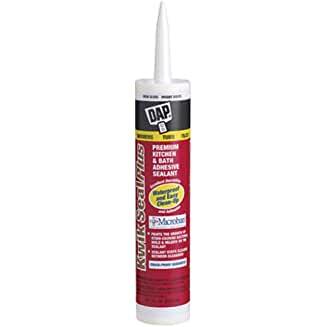 1) What is the best caulking to use? I was thinking GE2 kitchen and bath? 2) What is the best way to remove the old caulking? I was thinking exacto knife then rubbing alcohol. 3) When applying the caulking should I tape it off or just free hand it? 4) Any other tips or comments? Yes, a razor blade and patience to remove the existing caulk. Hopefully it is latex, it will make your life a whole lot easier. Remove as much as you can, wipe it down with a damp cloth, alcohol if it's silicon. When dry, apply your new caulk. I prefer latex caulks, they're easier to deal with and last just as long as silicon, without the hassles. As for installation, the key is to lay in a very small bead, then lay it off with your finger in 3" strokes, cleaning your finger after each stroke. Once you've done that, go back and run your finger along the entire joint in one sweep to fully smooth it into place. If using latex, a lightly wet finger will glide and smooth the caulk better. If using silicon, lay in the bead, then mist it with alcohol before laying off with your finger, the silicon won't stick to the alcohol. Remember, 3" strokes, cleaning finger in between, then one full sweep. Use a small amount of caulk, and use the tip to force it into the joint without plowing the material around the tip and making a mess. Once laid off, if you need to add more caulk, add more caulk and repeat the layoff procedure. I have been using silicones for these types of areas but latex caulkings have made some big improvements over latexes of a few years ago. There are many that are water proof and mildew resistant now, which used to be only possible with silicones. I would not use them in bathtubs or showers but a counter top would be fine. Be sure what you use says it’s ok on granite. Is their a specific one you would recommend? I am in Toronto and we have both Lowe’s, Homedepot and a ton of specialty stores.